To purchase Headwaters please click HERE to create an account or log in to My Account if you already have one. Sometimes adversity has a way of turning a difficult situation into something extremely positive. The story of COHO Headwaters certainly is an example of that “lemons into lemonade” thing you always hear about. For the first three vintages COHO made a delicious 100% Cabernet Sauvignon wine entirely from fruit grown in the Coombsville section of Napa Valley, just east of downtown Napa. In the middle of harvest in 2005 the warehouse where our finished wines were stored was set on fire. Sadly we lost our entire inventory and were effectively out of business for a year until we could bring the wines safely aging in barrel at our winemaking facility to market. 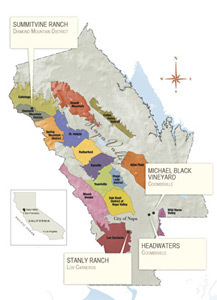 To complicate the situation, the Michael Black Vineyard, which normally produces very small amounts of Merlot fruit, doubled its output due to the extremely long, cool growing season. Not wishing to produce all that wine into a single vineyard Merlot, the decision was made to blend a goodly portion of the Merlot fruit with several tons of Cabernet Sauvignon grapes that friends had given us (the generosity of the wine industry) into a new red blend that we named Headwaters. Starting with the 2006 vintage, the Headwaters blend transitioned to a Coombsville area Cabernet Sauvignon dominated wine with about 30-35% Merlot, and seasoned with Petit Verdot. The fruit sources remain predominately from Coombsville, with the likeliness that future vintages will incorporate some fruit from select Napa Valley appellations and introduce other Bordeaux varietals into the blend.